As I’ve mentioned a few times on the blog I’ve been having issues with my hair. It’s been thinning, and it, along with my skin, has been dry and dull looking. I’ve been tested and my doctor agrees it’s likely a combination of stress and age. Well I’m not taking this lying down; I’ve been doing my research and trying a few different things and the best results I’ve found is from changing my diet and adding supplements. As they always say, beauty starts from within. I’ve tried some popular brands of supplements geared specifically towards hair loss and haven’t been thrilled with the results – greasy hair, breakouts, and not a huge difference in my hair. After doing more research, I decided to go more direct with vitamins and supplements know to improve hair, skin, and nails. One that I bought was Nature's Bounty® Hair, Skin & Nails Gummies. Two weeks later, they reached out and asked if I’d like to do a post about their product. Um, yeah, I’ve been gobbling two of your tasty gummies each morning already. And I did say I was going to write about my new hair routine on the blog! 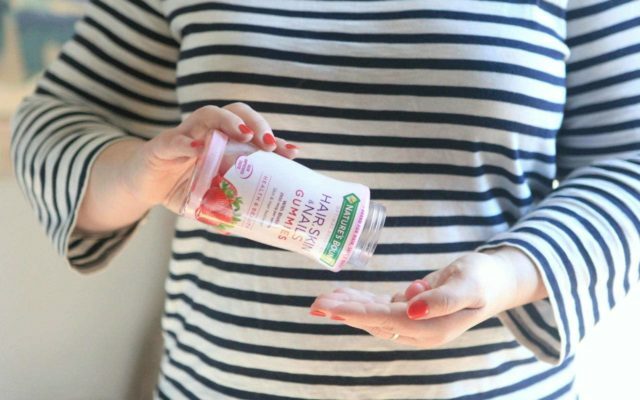 I do take some other supplements along with my Nature's Bounty® Hair, Skin & Nails Gummies and will share in a future post, but this is an addition that’s easy to add to my morning routine. I usually keep my two daily gummies to snack on during my drive to the office. I have seen a positive change to my hair and also to my nails. My hair looks more lustrous, and my nails, which break so easily, seem healthier. Nature's Bounty® Hair, Skin & Nails Gummies contain no artificial flavors, milk, lactose, soy, gluten, wheat, yeast, or fish and are sodium free. If gummies aren’t your jam, these same ingredients come in Softgels (they sent me a bottle, I haven’t tried yet but will after I finish my current bottle of gummies). 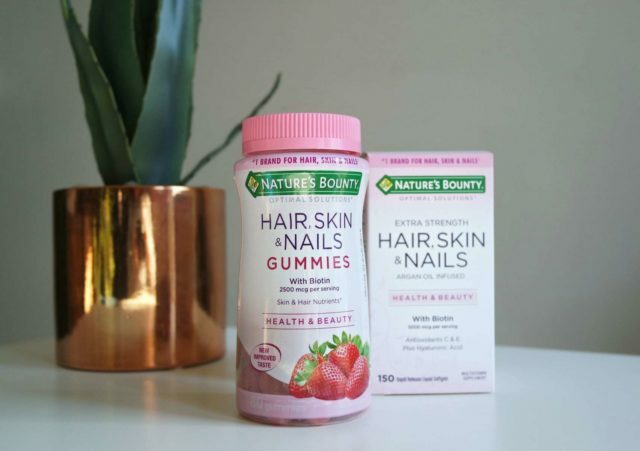 You can find Nature’s Bounty Optimal Solutions Hair, Skin & Nails Gummies and Softgels in the beauty aisle of your nearby Walgreens. 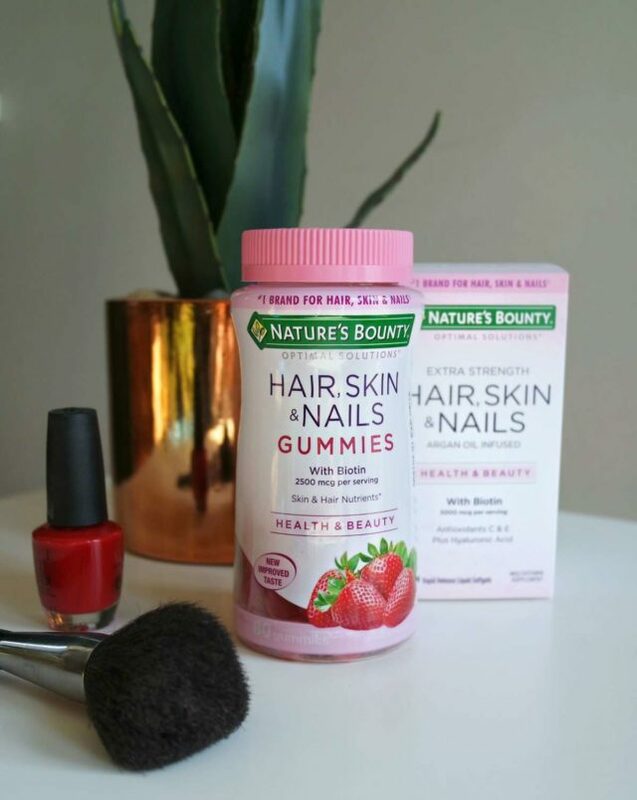 Nature's Bounty® Hair, Skin & Nails Gummies are full of vitamins to help you feel healthy, feel beautiful and feel well. Nature’s Bounty is so confident in their product that if for any reason you don't like it after 30 days, they will give you your money back. 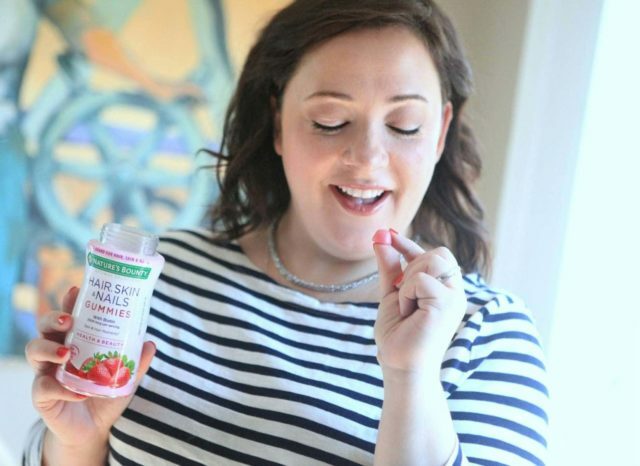 I love these vitamins – they’re like little candies (which is never a bad thing) and I truly believe that I’ve noticed an improvement in my nails. If we don’t break the bank, and we actually enjoy taking the little buggers, what can it hurt? Agree! I get powder dip acrylic layers on my nails for strength and long-lasting color but they would crack after two weeks. Since using these I can go almost three weeks before needing to return to the salon, I think because my natural nail is stronger! I’ll delve in more in a different post (sponsored post so I didn’t want to go on a tangent about other things) but a big change is cutting out most red meat, any cured meats, and most alcohol. Pretty much all I drink is water with the occasional coffee, tea, or matcha. I drink a lot of naturally flavored seltzers and sparkling waters to switch the game up; a La Croix with ice in an oversized wine glass feels super decadent! I have taken the gel caps version of this but I have been lazy about taking it every day. I now have a baggy of backup vitamins at work in case I forget them. I have a few I take that I FEEL when I don’t take them (borage oil for example) and it keeps me more consistent.